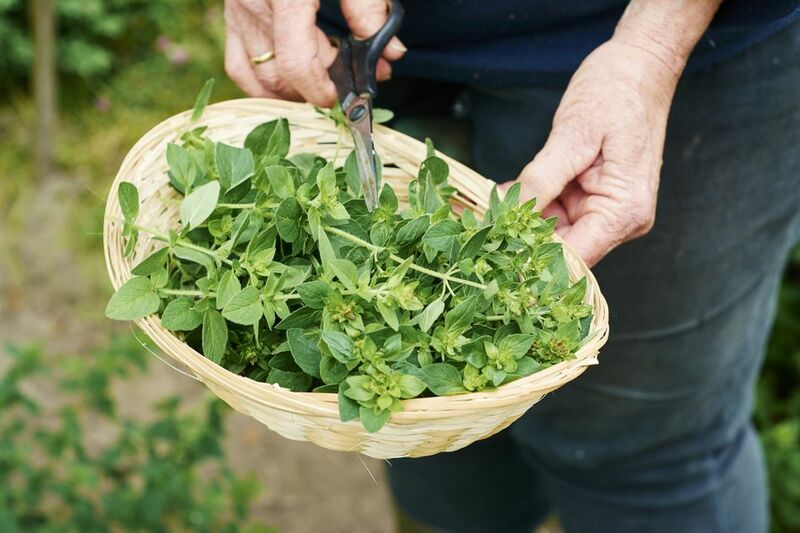 Oregano is easily grown in the garden at home, whether it's in the backyard or in a container. Hopefully, you have fresh oregano at your beck and call. If that's not the case, though, grocery stores typically carry fresh oregano in the produce department. Store it properly, so it doesn't wither away unused in the refrigerator. In most cases, fresh oregano in the grocery store will be packaged in a plastic clamshell. Peer into it to make sure that the oregano is still looking fresh. Purchased fresh oregano branches should be rich green in color and not the least bit limp. If you're picking oregano from a garden, let the morning dew evaporate before harvesting the herb. If you pick it before the water has gone, it could damage the leaves and release the oils, which you would rather keep inside the plant for when you cook with it. Fresh oregano must be used quickly. Whether it's homegrown or purchased, oregano should be stored in a plastic bag in the refrigerator for up to three days. If you place a slightly damp paper towel in the bag with the oregano and leave some air in the bag, it may extend the life up to one week. You may also extend the shelf life of fresh oregano by storing whole stems with leaves in a glass of water with a plastic bag loosely tented over the glass. Fresh oregano can also be frozen. Before doing so, though, wash and dry the fresh oregano sprigs. Strip whole leaves from stems and place in plastic bag loosely without crushing, but remove all air. Freeze and keep in a location where it will not get crushed. No need to thaw before using. You can also mix chopped leaves with a small amount of water or puree them and freeze in ice cube trays. Once frozen, pop out the cubes into a plastic bag and seal tightly. Use frozen oregano within one year. Unlike with other herbs, dried oregano is often preferred over the fresh herb. It provides a subtle flavor to Italian, Mexican, or Greek cuisine without overpowering the other flavors. To dry fresh oregano, tie sprigs into a bunch and hang in a cool, dark place with good ventilation. Once dried, seal tightly and store away from sunlight. In general, dried common oregano sold in the grocery stores is actually a mixture of different varieties of oregano combined with marjoram and thyme. You could also pull all the oregano leaves off the stem before drying, spread them across a baking sheet, and let them dry. As with all dried herbs, dried oregano should be kept in a cool, dark place in a tightly-sealed container and used within 6 months for the freshest flavor. It will not spoil if kept longer, but its potency will deteriorate greatly with time. When cooking with dried oregano, rub the herb between your fingers just slightly. The warmth of the hands will release its flavor.